Starting from as low as $900 to move from Miami to Sarasota (or moving from Sarasota to Miami). Only Straight deliveries. No waiting! Have you decided to change your life completely and move to the coast of the Gulf of Mexico from the east coast of Florida? Are you planning a move from Miami to Sarasota, FL? Easy Florida Moving is happy to show you the services we offer for those planning a relocation, since we are the Top Rated Mover in all of Florida, and we know this state the best. We handle local, cross country moving, household and office moving processes. This means that no matter how big or small the move is going to be, we will make sure to take care of it fully. Our team of experienced packers will handle the process of packing/unpacking service, loading/unloading, and labeling with the delicate and careful approach. Also, if your furniture is not yet disassembled, we will be happy to do that for you. If you are moving from Sarasota to Miami as well, not to mention any other part of Florida, and your new place is not yet ready, we offer convenient and safe storage facilities. This will make the process of relocation simpler for you. Specialty items, like antiques, large sized TVs, and large appliances will be taken care of by our packers, which know best about handling such items. We have a passion for moving, and we like to make the impossible happen. 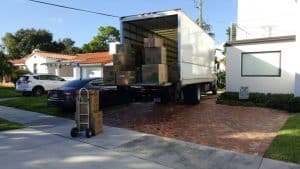 We love our customers and are ready to offer only the best and professional service when moving from Miami to Sarasota. Easy Florida Moving will be happy to explain further why our company deserves special attention when it comes to qualifications and attention to detail. We are always on time. Our team is very punctual and reliable. Easy Florida Moving does not charge you more than the Flat Rate Moving. Our amiable Customer Service Team is happy to answer any of your questions all day, and every day, including the weekends. When it comes to wrapping your valuables, we use only the best quality of materials. Our knowledgeable team of Miami movers can reach you within an hour, due to our location in South Florida. Moving from Miami to Sarasota, Florida cannot get any simpler than this! Without any further due we would like you to consider us to move you to the next destination, no matter if it is in Florida, or any other state. Give us a call for an obligation-free Flat Rate Quote that will cost you nothing! Let’s get moving together!